To get to Basaksehir's stadium from central Istanbul you take the metro to the end of one line, then to the end of a second, then to the end of a third. Then you take a bus. This frontier neighbourhood on the European side of Istanbul is populated by groomed and clipped parks, wide boulevards little-troubled by cars, tundra-like undeveloped valleys, sleek gated-complexes and dingier clusters of apartments – and a shiny new stadium looking like a spaceship landed in the outer fringes of the city. After thrashing front-runners Galatasaray 5-1 in November and a victory over Antalyaspor last weekend, Basaksehir are heading towards the winter break sitting top of the Super League. Just a few years ago Basaksehir was a municipality club, with only 30-40 fans. But it was a tiny club with huge ambitions. Istanbul Basaksehir began life in 1990 as an Istanbul municipality team, rising up from the amateur divisions and treading water in Turkish football's second tier for around a decade, until a young businessman, Goksel Gumusdag, became the club's president in 2006. Abdullah Avci, a promising coach who had worked with the Galatasaray and national youth teams, was recruited to the club – then called Istanbul Buyuksehir Belediyesispor (a mouthful meaning 'Istanbul Metropolitan Municipality', typically shortened to 'IBB'). They won promotion to the Super League in 2006/07. In 2009/10 they finished sixth. In 2011 they reached the Turkish cup final, losing to Besiktas on penalties. As an unfashionable municipality club, IBB were playing in Istanbul's vast, wind-blighted Olympic Stadium in front of a few dozen people, but Gumusdag had seen the potential in embedding the club in the relatively new neighbourhood of Basaksehir; a stronghold of President Erdogan's socially-conservative AK Party. Basaksehir was developed in the 1990s while Erdogan was Istanbul's mayor to appeal to people seeking space, cheaper property, and a conservative lifestyle. Gumusdag noted that, with a growing population of over 300,000, Basaksehir had a large pool of potential supporters and players. Istanbul's municipality began building the club a new 18,000 capacity stadium in the district. Avci's growing reputation landed him the job of Turkish national team coach in 2011 and Gumusdag also left the same year. IBB were relegated in 2012/13. But the club was promoted back to the Super League the following season, and both Avci and Gumusdag returned in 2014, just in time for the completion of the new stadium – which marked a turning point. 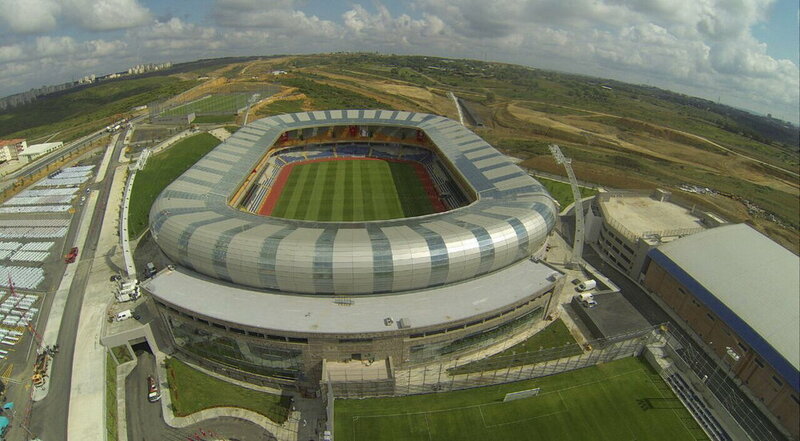 Basaksehir's 'Fatih Terim Stadium' (courtesy of Arima architects). Gumusdag is married to a relative of Erdogan, who had supported and supervised the stadium project from the outset. Unlike most new stadium projects in Turkey, it was built efficiently and quickly – completed in under 18 months. Erdogan – who used to be a semi-professional footballer – even played in the stadium's opening ceremonial match in July 2014, wearing a Basaksehir shirt and the number 12 – the match took place just before the presidential elections in which Erdogan became Turkey’s 12th president. In a barnstorming, fairy-tale first half, Erdogan dragged his team from 3-0 down to a 4-3 half-time lead by scoring a hatrick, amid some fairly lackadaisical defending. One chipped finish led the pro-government Daily Sabah to liken Erdogan to Lionel Messi and Gheorghe Hagi. Erdogan was substituted at half-time and Basaksehir have officially retired the number 12 jersey in homage. The new stadium rooted the club in the community and also heralded a major new incantation. The vast majority of Turkish clubs are civic associations, owned by members who elect a president for two or three-year terms. Presidents are generally hostage to short-termism and impatience, and are tempted to take on loans and splurge on expensive transfers safe in the knowledge that they can walk away and leave the club with the fallout. The amount of debt in Turkish football is accordingly immense, growing, and frequently crippling or ruinous. But it's easy for a small club like Basaksehir, with few members, limited debt – and no fans – to shift models. Eight shareholders, mostly representing big companies close to the government, bought and privatised the football branch of the club in 2014. The team was renamed 'Istanbul Basaksehir FK'. "The ownership model helps executives to make long-term plans," Basaksehir’s Executive Director Mustafa Erogut told me. "Because when you don't own the club, and you have the election pressure on you, you just think about next Sunday." Basaksehir still sign the odd, expensive player in his twilight years (i.e. Emmanuel Adebayor), but – unusually for Turkish football – they also have a strong focus on scouting and developing youth, and have done some astute business, such as buying the talented young winger Cengiz Under from Altinordu for €500,000 in 2016 and selling him on to Roma in the summer of 2017 for €13.4 million. Basakshir are currently building a huge youth academy with 11 full-size training pitches. While they want talented young footballers to join the academy, they also want to give other kids the opportunity to play football, in a city that is often bereft of green, open space. Basaksehir are developing education facilities that can teach skills in marketing, media, and sponsorship. Private ownership does not preclude huge indebtedness or clubs being used by wealthy owners as vanity projects or to launder money, process debt or promote other ambitions. An unpopular president at a failing club can remain in power. Nevertheless, along with having no fans, the ownership model has helped free Basaksehir from mass expectations and short-term pressure and has given Avci the time, stability and authority to consolidate his methodical assembling of the team. Abdullah Avci has now coached Basaksehir in over 300 games (courtesy of Tribunsel). Avci has drilled Basaksehir into a refined tactical organism, a mixture of youth and experience that is stingy in defence and able to efficiently plunder goals from counter-attacks and set-pieces. There is an obvious camaraderie about the team, they don't panic when falling behind, and have gained an un-erring ability to out-manoeuvre and beat the biggest teams. 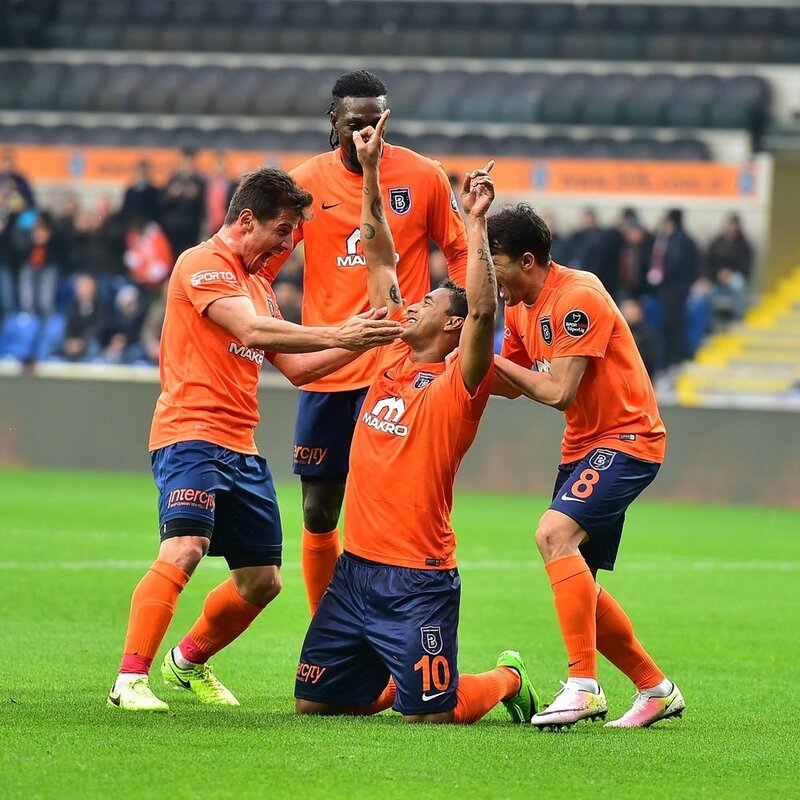 Basaksehir finished fourth in both 2014/15 and 2015/16, qualifying for the preliminary rounds of the Europa League. Last season Istanbul Basaksehir finished second in the Super League and lost in the cup final. The club had a new stadium and a new structure. It needed to build a fan base. The fan group '1453 Basaksehirliler' was set up in 2014. They work with the club to recruit fans young people in the neighbourhood, giving talks in schools and offering cheap tickets, and have a strict ban on swearing and violence. Basaksehir is now often getting attendances of 3,000–5,000. The fan group '1453 Basaksehirliler' (courtesy of their Facebook page). The '1453' in the fan group name refers to the year of the Ottoman conquest of Constantinople, a nod to the Ottoman-fetishizing AKP government, but Burak Bilgili, the co-founder and spokesperson of the fan group, told me that they try to keep 'politics' out of the stadium. "But there are certain values – like patriotism, respecting the nation, the flag – and we don't allow members to disrespect them," he told me. The club has still been involved in the occasional political controversy however, including allegations of anti-Kurdish racism. Some fans of other clubs don't like Basaksehir because they see it as an inorganic project, created from the top down, without history or romance, benefitting from its powerful connections and enjoying success that eludes many historic, well-supported clubs. "It’s Erdogan's team" grumble many anti-government supporters. Basaksehir counters by asking why a huge new district shouldn't have a football team and points to government support for many other clubs. Ultimately though, it’s hard to shake the club’s synthetic aura. Basaksehir plays in a luminous, construction-site orange. Most of the spectators seem to be curious, picnicking onlookers, rather than fans; when the noise dies down among the 50 or so singing fans, there is the ambient, moist sound of sunflower seeds being threshed. You are as likely to see a Besiktas shirt as a Basaksehir one in many sections of the crowd. To make real fans and an identity is generational work, especially when the vast majority of Turkish fans are in thrall to the elite teams. Despite beating Braga 2-1 earlier this month, Basaksehir were knocked out in the group stages of the Europa League. But it is a disappointment that should focus their energy for the title campaign. The challenge for the Super League title is remarkably open this season; there are currently only five points separating the top seven teams. With Besiktas, Fenerbahce, and Galatasaray all struggling for consistency this season, it may be Basaksehir's best chance of becoming only the third team outside of Turkey's 'Big Three' to win the league. The celebrations will be mild.